Stoke City chairman Peter Coates says he fully expects Potters goalkeeper Jack Butland to recover from his injury and enjoy a successful England career. 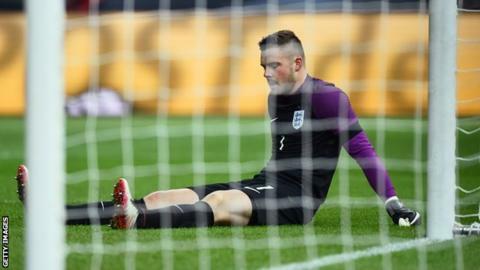 Butland, 23, will miss Euro 2016 in France following ankle surgery after being carried off during England's 3-2 friendly win over Germany in March. "We've got the very highest expectations of him," Coates, 78, told BBC Radio Stoke. "It was no surprise that he was the obvious choice to replace Joe Hart." Butland, who recently signed a new long-term contract with Stoke, had been an ever-present in the Potters' Premier League campaign before picking up his injury in Berlin. And although a likely return date for the former Birmingham City keeper is not yet known, Coates is certain Butland's international ambitions will not be harmed. "We're hugely disappointed for him - he deserved his opportunity," Coates continued. "He's been through the England youth system and he's very highly thought of. "We've seen him have his first full Premier League season and do really well." In the absence of Butland, Stoke gave a Premier League debut to Jakob Haugaard in Saturday's 2-2 draw with Swansea. The Dane was unable to prevent Stoke throwing away a two-goal lead but Coates was pleased to see Haugaard given his chance. "We weren't surprised (he played) - the manager and his coaching staff all have great confidence in him," he said. "He had a good first game in the Premier League." Eighth-placed Stoke's Europa League ambitions suffered a setback against the Swans but Coates says qualifying for Europe next season remains the target. "It's something we'd like to do - for the club, the supporters and everyone connected to Stoke," Coates said. "If we can be challenging that'll be good - Uefa are trying to encourage English clubs to take it seriously through the finances and I think we do."